The Halal Industry Development Corporation Sdn Bhd (HDC), an agency under the Malaysian Ministry of Economic Affairs, expects Malaysia’s halal exports to increase by between four per cent and five per cent this year from the RM43 billion recorded in 2017. Malaysia’s intake of direct taxes rose to a record last year, easing pressure on a budget deficit that’s expected to mark a five-year high. Malaysia will reaffirm its position on issues related to its national interests such as those concerning palm oil at the 22nd Asean-EU Ministerial Meeting (AEMM) in Brussels on Monday, said Wisma Putra. Facilities for city folks with disabilities will be increased in stages to ensure they can carry out their daily affairs more comfortably, said Federal Territories Minister Khalid Abdul Samad. Does Malaysia need hate speech laws? EIGHT months after the historic results of the 14th General Election, the colonial-era Sedition Act is still alive and well. WHERE’S MALAYSIA HEADED WITH ITS RACE-BASED PREFERENTIAL POLICIES? After taking office last year, Malaysian Prime Minister Mahathir Mohamad’s government undertook a midterm review of the national development plan implemented by the previous administration. Malaysia’s finance minister said on Friday the government would be ready to discuss dropping criminal charges against Goldman Sachs linked to the 1MDB scandal if the bank pays $7.5 billion in reparations. Singapore and Malaysia officials will meet “in the coming weeks” to discuss ongoing disputes about airspace and maritime issues, Malaysia’s Ministry of Foreign Affairs said on Saturday (Jan 19). A Malaysian judge on Friday (Jan 18) ruled in favour of Wynn Macau in a case against a fund manager who owed the casino millions of dollars, the company’s lawyer said, the first time a casino has been allowed to recover dues in the country. Smartphone boom in rural Malaysia, WhatsApp gossip behind BN’s GE14 downfall? The higher numbers of rural Malaysians owning and using smartphones in 2018 fuelled “subversive” tactics against the Barisan Nasional (BN) coalition such as gossip on social media platforms WhatsApp and Facebook, eventually leading to BN’s historic defeat in the 14th general election (GE14), new research has argued. Westports Holdings Bhd (Westports) has garnered neutral views from AmInvestment Bank Bhd (AmInvestment Bank) given that the group has been affected by the recent reshuffling in global shipping alliances. Malaysia’s new strategy to combat drugs will focus on health and social support for users rather than enforcing criminal laws. Malaysia is considering imposing night-time curfews on young people under 18 years of age in a bid to protect them from negative influences such as drugs. THE private retirement schemes (PRS) attracted strong interest, especially among those aged below 30 years as the net asset value (NAV) rose 20% to RM2.66bil last year. Information, communications and telecommunications (ICT) firm Ofisgate Sdn Bhd plans to list on Bursa Malaysia in five years time as part of its expansion plan. Scomi Group Bhd’s sub-subsidiary Urban Transit Private Limited (UTPL) and subsidiary Scomi Engineering Bhd (SEB) have each received a notice of demand from India’s Axis Bank Limited for 624.63 million rupee (RM36.15 million) due to failure by UTPL (as borrower) and SEB (as guarantor) to pay under the bank facilities granted to UTPL. Kenanga Investment Bank (Kenanga) has announced its first warrant issuance of the year, providing opportunities for investors to trade in a volatile market. Malaysia believes it is time for the International Association of Anti-Corruption Authorities (IAACA) to play a bigger role in the worldwide fight against graft. Mizuho Bank (Malaysia) Bhd, HSBC Bank Malaysia Bhd and Daiwa Capital Markets Ltd (in partnership with Affin Hwang Investment Bank) have been appointed as joint lead arrangers for the 10-year 200 billion yen (RM7.6 billion) Samurai bond. It’s that time of the year again when the much-awaited dividend rates of the Employees Provident Fund (EPF) will be announced. A 38-year-old man in Malaysia was arrested on Sunday (Jan 20) after he slapped a doctor for refusing to issue a medical certificate (MC) to his wife. The phenomenon of renting fake girlfriends or boyfriends for Chi­nese New Year began in China a number of years ago and has now landed on our shores. 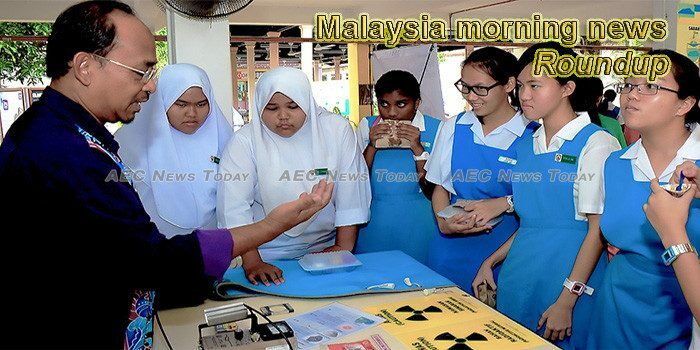 This week’s Malaysia morning news feature photo acknowledges International Day of Education, January 24.